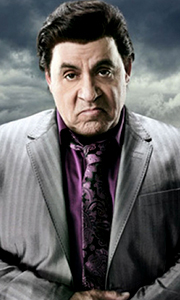 After sealing a bargain with the Feds back in New York, testifying against his "familys'" new boss and entering the witness protection programme, Frank Tagliano (Steven Van Zandt) is known to the inhabitants of Lillehammer as Johnny Henriksen. Frank's new life is going well. His club, the Flamingo, is a great success. He rules Lillehammer like a don, occasionally helping out locals with problems the law is unable to solve. His ex, Sigri..
After sealing a bargain with the Feds back in New York, testifying against his " familys' " new boss and entering the witness protection programme, Frank Tagliano (Steven Van Zandt) is known to the inhabitants of Lillehammer as Johnny Henriksen. Frank's new life is going well. His club, the Flamingo, is a great success. He rules Lillehammer like a don, occasionally helping out locals with problems the law is unable to solve. His ex, Sig..
All eight episodes from the third series of the TV comedy drama, centering on a mafia mobster's attempts to start a new life in Lillehammer, Norway. After testifying against his old buddies in the mob, New York gangster Frank 'The Fixer' Tagliano (Steven Van Zandt) enters the FBI witness protection programme, choosing to be relocated to Lillehammer, Norway (he liked the look of it when he saw the 1994 Winter Olympics on TV). Now Nor..
All 8 thrilling episodes from the first season. After Frank "The Fixer" Tagliano (Steven Van Zandt) testifies against his Mafia boss in New York, he enters the Witness Protection Program and makes an unusual demand: he wants to be set up with a new life in the Norwegian town of Lillehammer after falling in love with the place while watching the '94 Winter Olympic Games. Frank knows he is a marked man and figures nobody will ever look fo..